In this guide you’ll learn how to collect, monitor, measure, and analyze logs using a powerful log analysis tool like the Sumo Logic Apache app. 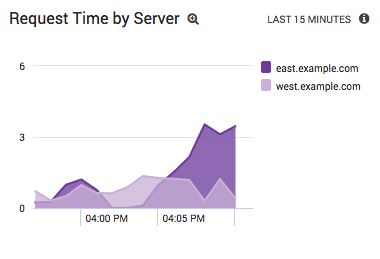 With this data at your fingertips, you’ll be able to detect bottlenecks, diagnose user problems, and gain deep insights into your overall Apache environment. 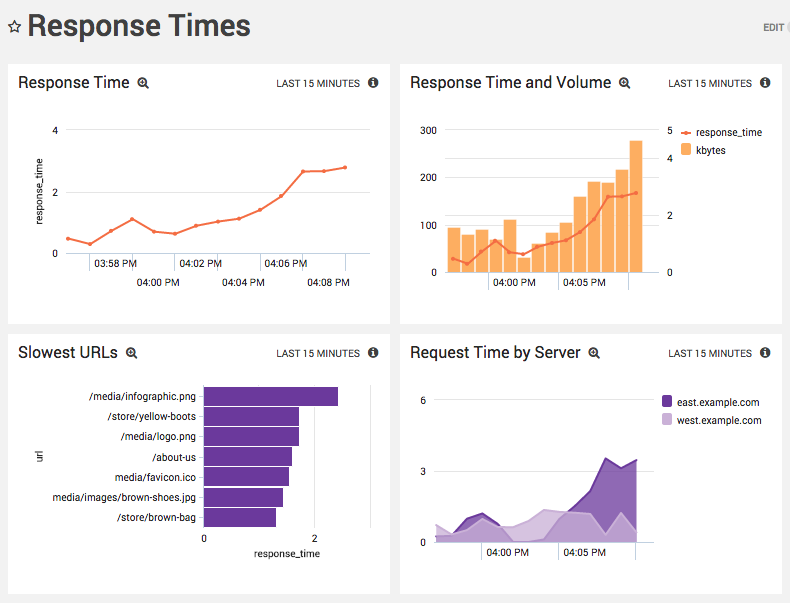 Apache response time can be analyzed by adding a %D directive to a custom log format. This records a new piece of data in your access logs: the number of microseconds between when the HTTP request was received and when the response was sent back to the client. See how the Apache App for Sumo Logic provides full-stack visibility. By comparing this information to the other fields in an Apache access log, we can uncover performance bottlenecks in a web application. The process is similar to Apache Traffic Analysis, but now we can look at speed in addition to hits and volume. A dedicated log analyzer like Sumo Logic makes it much easier to identify performance problems by aggregating and visualizing log data. To follow along with the examples in this article, you can sign up for a free Sumo Logic account. However, this only gives us a high-level view. We can identify if and when slow-downs occurred, but we need to run more diagnostic queries to get to the root cause of the problem. If you want to measure how well your application is running or how long it takes to load a page, all you have to do is look at the Apache Access log files. 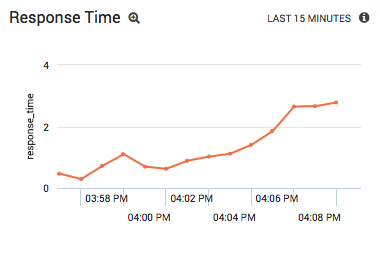 But before you can analyze, you have to make sure that you are capturing the Apache Access log response times. Make sure that the LogFormat directive is properly configured. %T will give you a way to log response times in seconds; however if you want more granular response times use %D which logs the time taken in microseconds. Once you have this logging turned on,sign up for a free Sumo account, download the collectors and configure them to pick up the log file. As soon as you have logs coming into the system, it only takes a few operators to parse the response times out of the log line and start using it. You can chart 95 percentile response times, or you can set up alerts on it, so that you get paged whenever response time is much more than what you expect. By visualizing the traffic volume as columns and response time as a line graph, we can quickly determine if there’s a correlation between the two. You typically want response time to stay relatively constant regardless of how much traffic you’re serving. 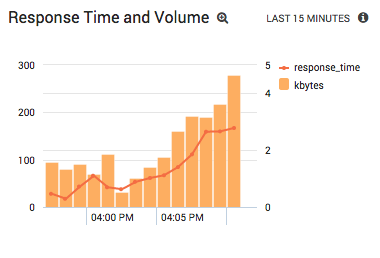 The above chart shows a large spike in response time when traffic increases, which indicates some kind of scaling problem. So, we’ve determined what kind of problem we’re having, but this still isn’t enough information to start resolving the problem. We also need to know where the problem is occurring. 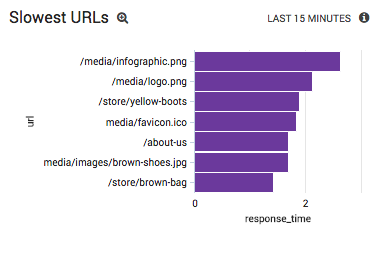 Constraining the query’s time frame to the response time spike from the previous section and visualizing the results as a bar chart tells you precisely which URLs need your attention. Your development or IT team can now figure out what the problem is, fix it, re-deploy, and then verify that they’ve implemented the correct solution back in Sumo Logic. It’s important to understand that a log analyzer’s role is primarily monitoring and root cause analysis—not remediation. Sumo Logic won’t fix Apache configuration problems for you, but it will reduce your mean time to resolution by telling you exactly where you should be spending your debugging efforts. Under-performing servers could indicate load-balancing issues, poor server configuration, or even problems in the hardware layer (e.g., an overheating CPU). You can continue digger deeper with more diagnostic queries, but again, remember that an Apache log analyzer is only designed to tell you where to look—it’s up to you to implement a solution. This article walked through a common scenario for many sysadmins: a customer complains that your company’s website is slow, so you need to dig into your Apache logs to figure out why. We started by determining when the slow-downs occurred, then we checked for scaling problems, slow scripts/resources, and under-performing servers. All we were really doing in this article was pivoting access log values on the %D format string. Every time you add a new piece of data to your Apache log format, it gives you a host of new actionable insights about your server performance. Learn how to use Sumo Logic to analyze Apache logs for legit robots versus malicious ones. Surface key insights to ensure your Apache server is protected.